Nothing beats the bliss of a stinky slipper. From Rover's perspective, shoes offer a tantalizing combination: they are chewy, readily available, and best of all, they smell like you. Rest assured that if you were in your "dog's shoes," you would develop a shoe fetish too. Luckily, you can prevent your drool-worthy shoe collection from becoming drool-covered toys. Evaluate your dog's lifestyle and chewing habits. Many dogs develop destructive chewing problems out of boredom, stress, frustration and anxiety. Is your dog getting enough exercise and mental stimulation during the day? 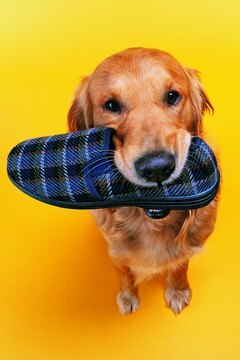 Is your dog chewing the shoes only when left alone during the day? Does your dog have access to appropriate chew toys? Is your dog a puppy in the teething stage? While it is true that a tired dog is a good dog, keep in mind that shoes will always retain a certain appeal, and as opportunistic beings, dogs will likely not pass up the chance to enjoy them if they are readily available. Invest in some safe, durable chew toys. If your dog is attracted to leather shoes, consider that they are basically treated animal hide, not much different from a pig ear or any animal-made chewies found on the market, explains dog trainer Pat Miller. If your puppy prefers a shoe to a chew toy, it is often a sign that your chew toys are pretty irrelevant. To make your chew toys more salient, try rotating them every now and then, stuffing them with treats or investing in long-lasting chews such as bully sticks; your dog will gain more interest in them instead of seeing them as boring as yesterday's news. Set your dog for success by preventing the rehearsal of the shoe-chewing behaviors. The magical word here is management. In other words, don't leave shoes around when you are not around, especially during the initial stages of training. Make it a habit of placing your shoes out of reach every time you are about to leave the room and leave your pooch unattended. On the other hand, leave out as many appealing and safe chew toys as possible. With no shoes around, but only lots of toys, your pampered pooch can only make good choices. Train the "leave it" command. Place one shoe in the center of the living room and sit right next to it. The moment your dog goes towards it, claim it as yours by saying "leave it" while covering it with one or both your hands. When your puppy backs away and gives up trying, say "good boy" and immediately give a treat. Repeat several times. You know you are on the right track when your puppy stops trying to get the shoe once he hears you say "leave it" and looks up at you in anticipation of the treat. At this point, you can try saying "leave it" without covering the shoe with your hands. Proof and generalize your "leave it" command by adding some challenges to the picture. Move slightly away from the shoe and watch your dog's body language. Because you are moving away, your dog may interpret this as a sign you are relinquishing the shoe; therefore, he may presume he has the green light to have it. As soon as he heads in that direction, say '"leave it." The moment he complies and looks up at you, say "good boy" and reward him with a big bonus prize: a stuffed Kong. With no shoes left around when you are away, and with a reliable leave it command that redirects your pooch to an appropriate chew toy, there is ultimately little margin for error and your pooch will look more and more forward to gnawing on his "chew toys" rather than your "shoe toys"; a win-win situation for all. "Nip" the chewing behavior in the bud; the more you allow the shoe-chewing behavior to establish, the more difficult it will be to eradicate. Make the "no chewing on shoes" policy clear by applying it to all types of shoes. 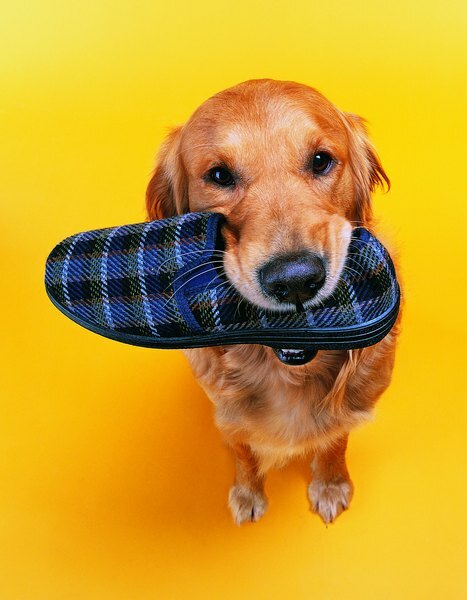 If your dog has a shoe in his mouth, say "drop it" and show a treat. Your dog will likely drop the shoe in exchange for the treat. Always remember to tell your dog what a good boy he is for giving up your expensive sandal in exchange for the treat. If you have a puppy in the teething stage, try giving him ice cubes, frozen dog toys or frozen wet washcloths to alleviate those sore gums. Don't punish your dog when he gets a hold of your shoes, as this will encourage him to run away with them. Don't chase your dog when he steals a shoe; this will turn into a fun game and your dog will steal shoes more and more. Never give old shoes you don't care about to chew on; your dog can't tell the difference between which shoes are acceptable to chew on and which are not. Does It Hurt Cats to Touch Their Whiskers? Why Do Dogs Chew on Shoes?